Fluid Conditioning Systems – Eagle Lake Systems, Inc.
Our compressor client developed a small, portable, personal cooling system for a military application. Our task was to develop an automated test & measurement solution for production testing of the Fluid Conditioning Module performance under a wide range of loads and environmental operating conditions. The key system performance parameter – ∆T, the temperature difference between the liquid input and the liquid output – presented a unique challenge that lead to a powerful new real-time measurement architecture. 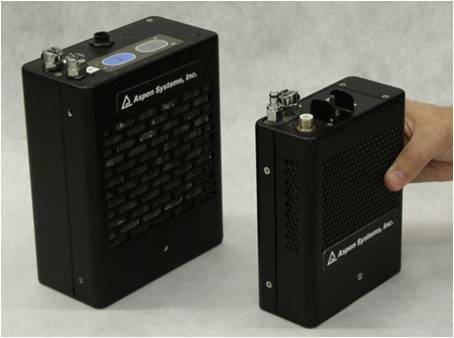 Eagle Lake designed, integrated, and deployed a LabVIEW-based measurement and control platform using modular data acquisition hardware from National Instruments. We created a novel Model-View-Controller architecture that featured a custom reconfigurable hardware device abstraction layer, an automated set point sequencer state machine, multiple independant PID control loops, and our proprietary "no wiring" user interface libraries. To measure the liquid ∆T – a calculated parameter from two measured temperature channels – we created a buffered data layer that could calculate virtual Process Variables on-the-fly from real physical input channels, output controls, program constants, or even other process variables – all configured using dynamic settings files that can be modified without changing the source code.